Andhara Pradesh is a south Indian state. Amaravati is the capital city of the state of Andhara Pradesh. Ubbalamadugu Falls alias Varadhapalayam Falls Or Tada Falls is situated at around 10 kilometers inside reserved forests near Varadhapalayam and Tada, in Chittor District, Andhra Pradesh state, India. It is one of the best weekend getaways for Chennai residents. Varadhapalayam Falls or Ubbalamadugu Falls is situated deep inside reserved forests. Mud roads are there to go to the falls. Vehicles go through a very scenic route with a large lake on your left side. You need to get entry permit for each person and vehicle at the Andhra Pradesh forest department entrance gate. Entry is allowed from 6 am up to 4 pm in the evening. You need to come out by 6 pm. Entry fee per person is rupees 50. Two wheeler entry fee is also the same. Car entry fee is rupees 200. The rates are written at the entrance. There is a fee for camera also. Please confirm the rates and pay the amount, at the counter only. Forest department will issue you a receipt for the amount paid. You need to travel around 3 or 4 kilometers from the entry gate to reach the parking lot. Some portions of the road are in off-road condition. On the left side of the parking lot, you will find a small temporary bridge to cross the stream. You may come across a few people bathing here on one side this bridge. If you walk straight, you can see the stream on your left side. Keep walking. Whenever you feel like bathing, turn to your left and take a refreshing bath int he cold waters of the stream. A word of caution. The water flow is very powerful to even carry adults. There are rocks along the path of the stream. Hence, take care. This falls and the stream are one of the best falls I have seen in South India. Since the falls is hard to access (which needs to be trekked for a couple of hours along the stream side), very few tourists goes to the actual falls. Entry fee also prevents many from coming here. Many of the other nearby falls in Andhra Pradesh state line Kone Falls, does not charge any entry fee, vehicle entry fee, camera fee, etc. How Do I Go to Ubbalamadugu Falls alias Varadhapalayam Falls Or Tada Falls? Ubbalamadugu Falls alias Varadhapalayam Falls Or Tada Falls is very close to Tada town and Sri City. It is around 90 kilometers from Chennai city. Sriharihota rocket launching station is situated very close to Varadhapalayam and Sri City. Always go via Tada. After crossing the Varadhapalayam goverment bus depot, you will find a sign board on the left side, written “Ubbalamadugu Waterfalls”. If you ask locals near the state border in Tamilnadu, some of them may misguide you (out of ignorance of the falls) to go via Sathyavedu town. This route is circuitous and should be avoided. Right now, from Sathyavedu to Tada road, a large number of culverts are under construction. It is very tedious to travel by this route. Sadasiva Kona falls is situated off the Puttur-Tirupati road in Chittor District, Andhra Pradesh, India. Its situated at around 10 kilometers distance from Majjiga Gunta. Sadasiva Kona falls near Puttur, Tirupathi. Sadasiva Kona falls is situated inside forest area. Amma Kona (Goddess Falls) is another falls situated very close to Sadasiva Kona falls. There is a temple dedicated to Lord Sadasiva (incarnation of Lord Shiva) along with his wife Goddess Kamakshi, near to the waterfalls. It is believed that hte King of Karvetinagaram constructed this temple. Maha Shivaratri is the main festival celebrated here at this temple. Lot of Lord Shiva devotees throng to the temple on that day. Ammavari Kona and Ayyavari Kona are two other nearby falls to Sadasiva Kona waterfalls. There are no shops anywhere near this area. You need to bring water, snacks,food, etc. You do not require any permits to go here. If you have a [amazon_textlink asin=’B01N69D9VL’ text=’Hanumex All Seasons Waterproof Adult Sleeping Bag’ template=’ProductLink’ store=’toursitinindi-21′ marketplace=’IN’ link_id=’c228f608-2f30-11e8-9822-f7bc88c773ee’] for Camping, Hiking And Adventure Trips, you may stay here in the night. How Do I Go to Sadasiva Kona Falls? 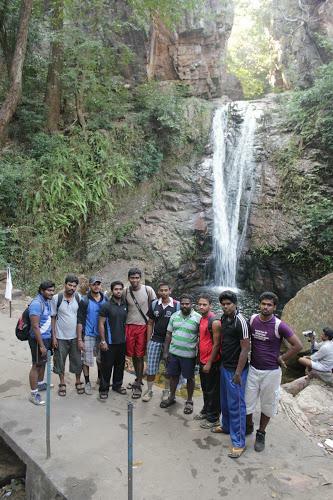 Puttur is the nearest major town to Sadasiva Kone falls. Puttur is at around 33 kilometers from Tirupati Temple town. There is a railway station at Puttur town. Buses are available from Putter private bus station (near Puttur railway station) to the falls, at 2 hours intervals. You need to get down at Nagileru bus stop. It may take around 45 minutes to reach Nagileru bus stop by bus. Sadasiva Kone falls is at around 2.5 kilometers distance from the bus route. Uthukkottai, the border town on the Tamilnadu – Andhra Pradesh inter state border, is at around 34 kilometers away from the falls. Bengaluru is at around 250 kilometers and Chennai at around 100 kilometers from Sadasiva Kona waterfalls. Kailasakona Waterfalls is another major falls at around 27 kilometers from Sadasiva Kona falls. Why Is Lepakshi Veerabhadra Temple So Famous? Veerabhadra Temple is a 16th century temple situated at Lepakshi, in Anantapur district, Andhra Pradesh state, India. This temple at Lepakshi is famous for its sculptures, carvings and paintings. This temple is one among the divyakshetras (holy temples) for Lord Shiva devotees. The temple is constructed in Vijayanagara style of architecture. It is constructed in 1530 or 1540,during the reign of King Achutaraya of Vijayanagar dynasty. It was constructed by two brothers, Virupanna Nayaka and Viranna, who were governors under King Achutaraya. Lepakshi Temple mural paintings includes scenes from the great epics, Ramayana & Mahabharata and also from Puranas, depicting the Vijayanagara pictorial art in its full grandeur. The fresco paintings inside the ante chamber is said to be largest such painting in Asia. These Lepakshi fresco paintings are well preserved. Veerabhadra temple at Lepakshi has two enclosures. The outer one has three gates; northern gate is the one which is normally used. The eastern inner gate takes you to the assembly hall, at the entrance to the sanctum sanctorum (sanctum sanctorum means innermost sacred place in Hindu temple). Sculptures and paintings adorn every inch of the hall and the ceiling. 14 avatars of Lord Shiva are depicted on the pillars here in this hall. Small statues of goddesses Ganga and goddesses Yamuna can be seen at the entrance to the sanctum sanctorum. Carvings of Lord Brahma and Lord Vishnu in Veerabhadra temple. Carved images of soldiers, horses, etc, can be seen on the exterior columns of this hall. Pictures of Goddesses Parvathi, Lord Shiva’s consort, flanked by female attendants can be seen on the southwest part of the hall. North eastern part of this hall has the paining showing Natesha with by Brahma and a drummer on each side. There is a “hanging pillar“, an engineering wonder, in this temple. One out of the total of seventy pillars hangs from the ceiling. You can pass thin objects like a sheet of paper or a piece under this pillar. Veerabhadra temple at Lepakshi is classified as a Monument of National Importance, by the Archaeological Survey of India. At around a 600 meters from this temple, there is a colossal statue of Nandi, carved out of a single stone. It is one of the largest Nandi statues in the world. How Do I Go to Veerabhadra Temple and the Nandi Statue at Lepakshi? Veerabhadra Temple is situated on the southern side of Lepakshi town, at around 600 meters from the city center. Lepakshi Temple is at a distance of around 140 kilometers from Bangalore. Lepakshi Veerabhadra Temple is at around 35 kilometers from Penukonda Town, a nearby major town in Anantapur district. Hindupur is another nearby city.